All estimated delivery service delays are always applicable from the shipping date and target locations within large cities. Some delays may occur if the product needs to be transferred from another location or if it is out of stock you will be advised promptly. *Rates are not for oversized items. Should your order contain an oversized product please consult our oversized product shipping details above. Examples of oversized items include: furniture, mattresses, large wine cellars, massage chairs and any over dimensioned products that cannot be shipped by regular courier. Oversized items will usually be displayed with a visual tag on their product page. Please email customer service for more details at info@linenchest.com. Currently, all shipping fees apply to Canada only, with the exception of certain rural areas and territories (i.e. Northwest Territories, Yukon, Nunavut). 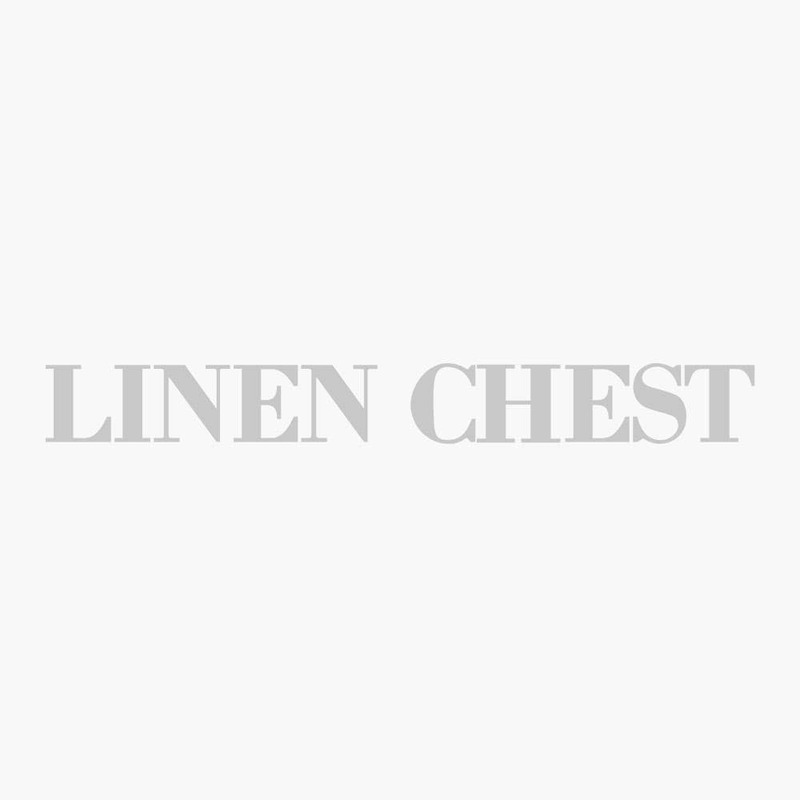 Please contact customer service via email before ordering for more details info@linenchest.com. Note: All orders with an oversized product will require a shipping quote. Free Shipping does not apply at any time to these Territories. Shipping fees are also not applicable on oversized items, such as certain furniture and over dimensioned products that cannot be shipped by regular courier. Please consult oversize delivery options below or contact us at info@linenchest.com for more details. *Please note that free shipping promotions do not apply to previous purchases, pending orders certain rural areas and territories (as mentioned above) and oversized items, and must respect the noted criteria. You can find out if an item is in stock by clicking on the item, it will indicate the availability and give a shipment ETS (estimated time to ship) message. If a product is out of stock, the message will reflect it. Most items are in stock and ready to be shipped. Orders for in-stock items begin the shipping process once the item is located in stock and your payment is approved. Most in-stock items should be ready to be shipped within 24 hours (one business days). If we need to transfer some items from one of our other warehouses in Montreal, it could take 2-3 business days. Otherwise, if we need to transfer your items from other warehouses outside Montreal, it might take 5 business days to be ready for delivery. If you have an account, you can check on your order status directly from your profile page. We ship with a courier and postal service. For this reason, we are not responsible for delays, extra charges or buyer’s order/information typing errors. The courier will attempt to deliver a parcel up to three times before returning it to us. The postal service holds the parcel at a postal outlet for about 10 days before it is returned to us if unclaimed. Any fees related to changes in delivery address or to re-shipping once the parcel has left our warehouse will be at the buyer’s expense. Unfortunately in both cases no specific block of time can be requested for delivery. This service reaches out to all Canadian addresses in major cities within 2-4 business days and up to 10 business days for certain other rural areas or zones. This service can be used for postal boxes, extended areas as well as any business address just like a mail service. Should there be nobody to accept the parcel upon delivery; a tag will be left with details on how to pick up your parcel at your local postal outlet. Postal outlets can sometimes be accessed easily with their extended morning, evening and Saturday hours and the parcel is kept for as much as 10 days before it is returned to us. Please make sure you have a photo I.D. when picking up your parcel. This parcel is fully insured and is traceable with your assigned tracking number, which you should receive by email. This courier service delivers its parcels in a very timely and secure fashion all across Canada. It reaches most zones and postal codes with its ground service. There are certain extended zones and areas in which this ground service cannot be used, such as remote and rural areas, postal boxes and Canadian Territories. Delivery to major cities is usually made within 1-3 business days in Eastern Canada and up to 3-4 business days to Western Canada. These deliveries require someone to be on location, Monday to Friday between 9-5pm, to accept and sign for it. Otherwise the use of a business or work address is recommended. All parcels are fully insured and can be traced with an assigned tracking number, which you should receive by email. • Sign and date it. The delivery person should also sign the slip and leave a copy for your records. Contact customer service immediately (within 24 hours) at 1 800 363-3832 selection option #3 or at webcustomerservice@linenchest.com. No fees will be charged for the shipping of a gift card. All gift cards are mailed out by regular mail services or courier services at our discretion. Putting customers first, Linen Chest is expanding its reach worldwide. While we currently accept delivery orders within Canada only, we will be expanding our delivery territory into the U.S & worldwide in the near future. 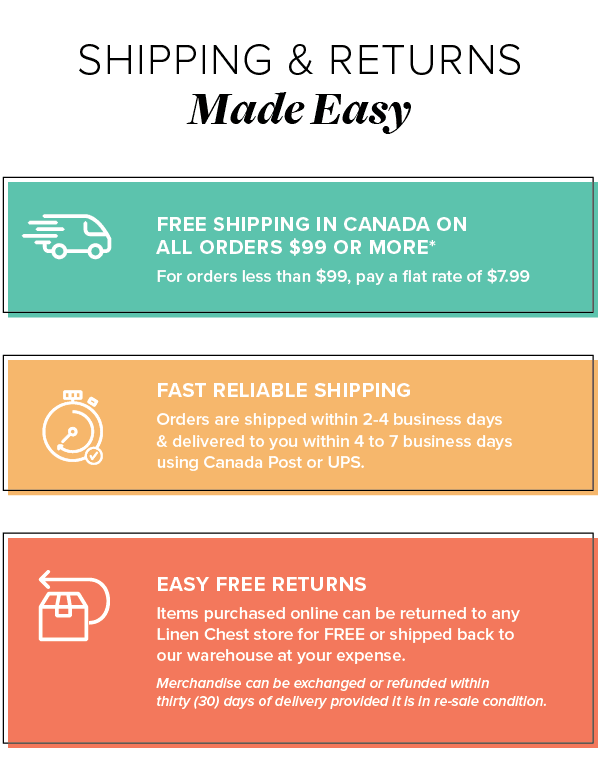 If you would like a quote on shipping outside Canada, please contact Customer Service at 1 800 363-3832 or email info@linenchest.com. We will be able to assess your needs and offer shipping quotes that suit your situation. Please make sure to supply the full list of items and quantities you wish to get a quote for as well as a full delivery address. For you security, we may require additional information before accepting your order. Linen Chest offers an Express Shipping Service using UPS next day, requiring a physical street address within UPS delivery zones. We also offer a Canada Post priority service in the event the delivery address is a P.O. Box, a rural address or simply not within UPS delivery zones. These services are not included in our free shipping promotions. Costs are calculated using the parcel’s weight, dimensions and delivery location. We will make sure you get a response during business hours and within 24 hours for evening and weekend requests. Please note that in order to respect the delivery process for express services, courier companies request someone to be at the location to accept delivery. Failure to do so may result in delays out of our control. In the event of weather issues, or other delay issues outside of the courier’s control, we will work with the courier to make sure parcels are delivered ASAP. We want you to be fully satisfied with every item that you purchase from LinenChest.com. 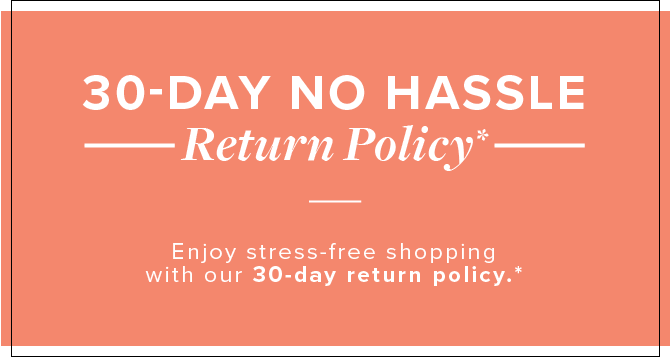 If you are not satisfied with an item that you have purchased, you may return the item within thirty (30) days of delivery for a full refund of the purchase price, minus the shipping, handling and other charges. The parcel can also be returned for an exchange within thirty (30) days of delivery. We will gladly refund or exchange your purchase within 30 days upon presentation of the receipt. Products can only be returned if unused, in perfect condition, in their original package and if they still contain all included documentation, pieces and accessories. Refunds are made with the same payment method used for purchasing the product. If you received a promotional item / gift card when you purchased the product (online or in-store), the promotional item / gift card must be returned unused; otherwise, the value of the item/the amount of the gift card will be deducted from the amount refunded. Shipping fees will only be reimbursed in the case of a manufacturer error, or one made by Linen Chest. Special orders and final sales are non-refundable and non-exchangeable. Mattresses are excluded from this policy. Please refer to the 90 days comfort guarantee. More details in-store about our gift registry refund and exchange policy. Conditions and exceptions apply; please contact our customer service at webcustomerservice@linenchest.com for any details prior to ordering online. 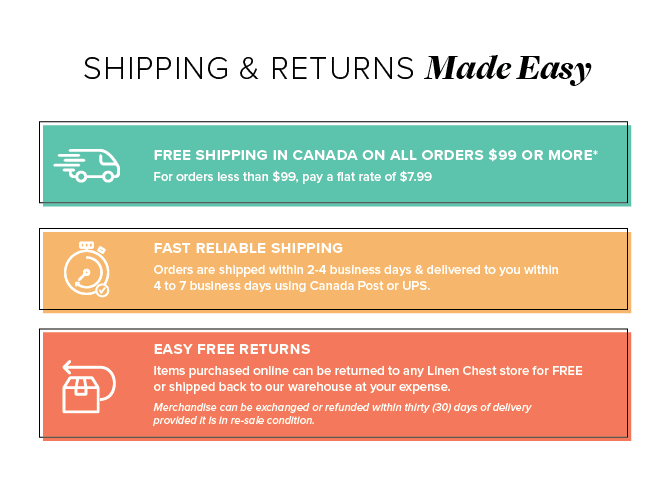 Contact Customer Service at 1 800 363-3832 and select option #3 (9am to 5pm) or email info@linenchest.com get a return approval confirmation. Enclose a copy of the documentation that accompanied your order. All products must be returned in good condition, in original packaging, and with all paperwork, parts and accessories, to ensure full credit. For your protection, we recommend you use an insured mail service for your return. You will have ten (10) days from the date of delivery to return it for a refund. Only the shipping cost will be refunded if the return is a result of a manufacturer defect or a shipping error on our part. For assistance, please call Customer Service at 1 (800) 363-3832 and selection option #3 (9am to 5pm) or email info@linenchest.com. All products can only be returned if unused, in perfect condition, in their original package and if they still contain all included documentation, pieces and accessories. The purchaser must bring the order along with a copy of the documentation that accompanied your order. Only the purchaser can return items for a refund, otherwise, if you are the recipient of an order, a credit note will be supplied as long as our return policy is respected. In both cases I.D. will be required for verification. Refunds will only be processed on the same payment method used on the original order. For assistance, please call Customer Service at 1(800) 363-3832 selection option #3 (9am to 5pm) or email info@linenchest.com. Many of the items come with a manufacturer’s warranty. For additional information on the manufacturer’s warranty for a specific product, please contact the manufacturer directly. If you haven’t completed your order, it is possible to edit it directly from the view cart page. Once your order is completed, please contact customer service at 1 800 363-3832 selection option #3 (9am to 5pm) or email us at webcustomerservice@linenchest.com. Upon delivery, immediately inspect your package for any potential damage that may have occurred during shipping. Carefully inspect the packaging and contents of the package. It’s normal for any package to show some wear. The delivery person should also sign the slip and leave a copy for your records. Contact customer service immediately (within 24 hours) at 1 800 363-3832 option #3 or at webcustomerservice@linenchest.com. Unfortunately at this time we do not offer a giftwrapping service. Please write a note in the comments section if you are purchasing a gift so we can make sure not to include any prices or an invoice inside the package. We can ship to anyone within Canada so your gift can get to its destination safely. You can also write a small message in the gift message box. We transcribe your message by hand on a blank gift card and include it in the parcel. *Please note we reserve the right to refuse writing gift cards. Please refrain from any profanity or derogatory terms.